Salt crystal lamps are natural ion generators, emitting negative ions into the atmosphere. Why is this a good thing? Negative ions are good for you! Negative ions restore and neutralize air quality. Negative ions can be used to treat illness and improve health. Our homes and offices are filled with electrical appliances and electronics (televisions, computers, fluorescent lighting, microwaves, heaters, air-conditioners, etc.). Use of such devices has been blamed for lowering our energy levels, making us feel tired, cranky, and depressed because of their emissions of positive ions. Keeping a rock salt lamp in areas where positive ions are polluting your air space will help neutralize the air you breathe. Balancing positive and negative ions also help reduce airborne infections. Pagan/Wiccan Expert, Patti Wigington, gives this advice for cleaning your rock salt lamps: "If your salt crystal lamp gets dusty, as they sometimes do, do not immerse it in water. Use a lightly damp cloth or sponge to wipe it down, and then dry it with a soft towel. An alternative to towel-drying is to just light the candle inside it, and let it warm up, which will dry it as well." 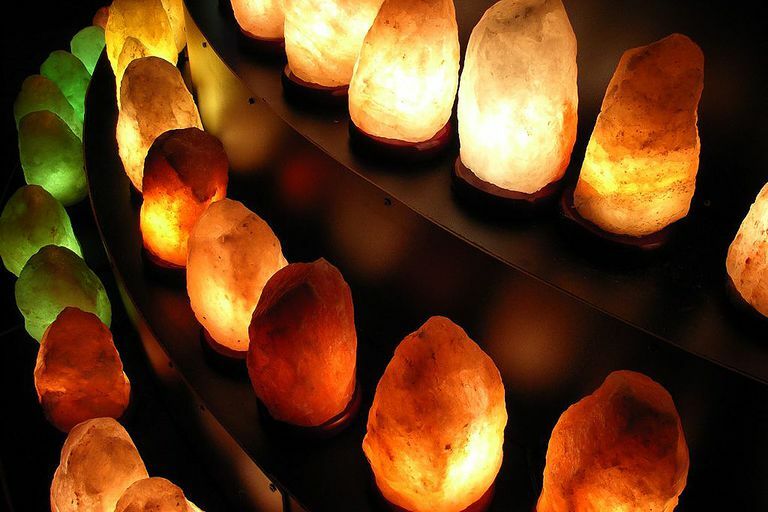 Rock salt lamps are made from salt crystals that are approximately 250 million years old from the Himalayan mountain regions. Mined crystals come in a variety shades including white, pink, peach, orange, and reds. You can choose a natural or sculpted shaped lamp. Sculpted lamps are available in a variety of shapes: spheres, pyramids, cones, blocks, bowls, etc. Tea-lights are also available. My lamps were purchased from IndusClassic.com and are of good quality.